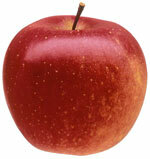 Winesap Apple, Virginia, late 1700s. Might that be a winesap on the right? And, gasp, might that perhaps be a royal gala keeping it company on the left? And what of the cider? Well, a real English or French cider is made out of specialized cider apples, which are, mostly, like chewing on lemons, tea bags, lumps of wood and bark, leaves, and hunks of parsnip soaked in honey. The most pure of all are picked wild out of hedgerows, where they have seeded themselves. 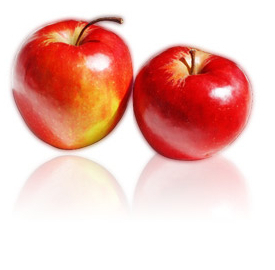 A winesap is a good start … for a tart sweet apple juice, or for providing the body for a cider. And Orchard Hill’s Red Roof Cider is like that … a good beginning, and most excellent for sipping beside the pool in the summer, or on the deck while the barbecue turns the air into downtown Beijing and the season’s first royal galas, from Brewster, are all sliced up real pretty on a plate, but it lacks the deep, complex flavours that would convince you to drive 500 kilometres for a taste. We could do it, though. Over on Vancouver Island, Merridale Cider does. Their Scrumpy will make you see light in darkness. It is the cider equivalent of a $80 bottle of hand-squeezed Cabernet Sauvignon left to ripen late, with the starlings being chased away by one’s children, and the night fogs wafted over the berries by hand, then fermented with wild yeast and left to breathe for the winter and the next spring in 10-year-old American oak barrels. It’ll make you put down the 15-year-old single malt. Here’s the worst part: You cannot buy it in the Okanagan Valley. They make just enough for Southern Vancouver Island and Greater Vancouver. I weep. Well, Mr. and Mrs. Dhaliwal, ahem. If you plant the trees, and make the cider, we will come and we will stay.